Many woodworkers have at some time needed or wanted a dowel for a project, and had to hop into their car to pick one up at the home center. Once there, you have a couple of choices of wood types, and if you are really lucky, the dowel might almost be straight. The sizing of the dowels available at a home center may not be exactly what you’d like: I’ve purchased 5 dowel sticks before, of the same size, only to find that they all were slightly different from each other when I measured them with my micrometer. So, if you have an important project, and want to use a specific wood that either contrasts with or matches your project, what the heck do you do? Well, enter the Lie-Nielsen Dowel Plate, which is exactly what it sounds like it would be: a thick (1/4”) steel plate with a range of hole sizes, optimized for many tasks. The Dowel Plate’s holes are the following sizes: 1/8”, 3/16”, 1/4”, 5/16”, 3/8”, 1/2”, and 5/8”, along with two mounting holes (one on each end). If you prefer to work in the Metric measuring system, there is also a Metric Dowel Plate that can accommodate you with the following hole sizes: 3mm, 4mm, 6mm, 8mm, 10mm, and 12mm. These will provide a nice range of sizes available to woodworkers that want to create their own dowels. These Dowel Plates are made from A2 steel (hardened to Rc60 – 62), and each of the cutting holes are bored straight down for .025”, at which point a six degree clearance taper begins, to ease the dowel’s release after the cut. The top portion, where the holes are still straight, is made in this manner so the original sizing of the hole is retained even after subsequent sharpenings. To sharpen the dowel plate, just hone the top surface of the plate with your water stones. It is likely however that they won’t require sharpening for quite some time, unless you happen to make and sell dowels for a living. Earlier I mentioned each plate has a mounting hole on each end. You can make a wooden box, with tight tolerances on dimensions, so the plate fits down onto a rabbet on all four sides, with adequate room to run screws through those mounting holes into the wood. And then you have a portable method for using your Dowel Plate that is ready to use, and doesn’t take much additional room to transport or store. If you might be planning to use the Dowel Plate in your shop daily, you could modify the top of your workbench (or another table), by routing out a section not too far from an edge (likely along the end of the bench), and all of the way through the top, where a basket could sit/hang to catch the dowels. You should make the through-hole large enough to allow all of the dowel sizes to easily fall through, and create a rabbet so the Dowel Plate would sit flush with the top, and have a solid base. To use the Dowel Plate, start with a straight-grained wood, as that will provide the best results (both White Oak and Ash have flexible properties that excel when asked to snake through off-set holes). This wood can be off-cuts from the same project (to match coloring as close as possible), leftover wood you have lying around, or a wood specifically purchased for the dowels you need. I usually cut blanks myself (riven wood is the strongest, guaranteeing no cross-grain exists) so they are approximately square in cross-section, in whatever length I require. Then I use a small plane to quickly modify the square form into an octagon, by removing material from each of the four corners. I also pare down one end slightly, using a chisel or a sharp knife, depending on what feels most comfortable. I work the end until it feeds into the cutting hole a bit more easily, and then proceed to drive it through with a large wooden mallet. It doesn’t take many attempts to determine the maximum blank size for a given species of wood. If you have pre-cut some blanks that are too large, you can either trim them down, or if they are within the Dowel Plate’s range, work your way through the plate’s holes, until you arrive at the size you need. Awhile ago, I made a small side table for my family. My wife had seen some “put together/throw away in a couple of years” types of tables, and told me she was going to purchase one. I was shocked she would even entertain the idea of owning that stuff, but I guess that was her way of telling me I was too busy with other projects, and it got my attention. I had some nice Walnut that I used for the top, legs and stretchers. While I’m not going to go into great detail on this build, I do want to focus on the leg/frame joinery. I used mortise and tenon joints at all the corners to make this table strong, and by pinning each joint with a dowel, may have even crossed into the “last forever” category. I bought some “sticks” of a light dowel material, labeled 1/4”, that would provide good contrast, as I wanted the dowel to be noticeable. I marked and drilled all of the holes in each mortise, and then drilled the holes in each tenon slightly off-set towards the shoulders, so the dowels would help pull the joints even tighter. I went to put the first dowel into the hole, and to my shock, it was too large. Well, I was about to freak out, but luckily found a solution – I microwaved each dowel, which removed enough moisture to allow the dowels to fit in the holes. Now, if I’d had a dowel plate, and spent just a little time to match up the size of each hole to a specific drill bit, I’d be golden each and every time. There’d be none of the hair pulling, wondering if I’d just wasted some nice wood. I would, however, still keep in mind the fact that wood moves, and if you make dowels in advance, it’s possible they may just absorb enough moisture from the air to have a similar situation to the one I described. I find it’s always a good idea to test the fit of the dowels prior to applying glue, so you have the opportunity to resolve an issue, instead of having to toss some otherwise nice glue-laden purpose-made dowels. I hope this article was helpful – please let me know if you have any questions. 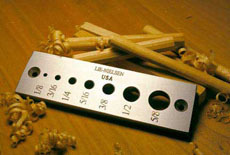 Click to take a closer look at the Lie-Nielsen Dowel Plates.